With all the talk of the imminent trade of Cliff Lee, M’s fans need some good news – some hope. Well, hope’s taking the hill for the Tacoma Rainiers tonight. 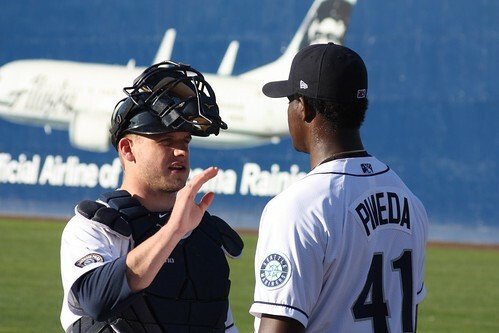 Michael Pineda faces off against the Salt Lake Bees tonight at 7, and you can switch over to the audio on 850am or pick up the live stream at the Rainiers’ website. Jay and I are in Tacoma, and will keep this updated with notes and photos. This season hasn’t gone how we wanted, but I’m still really happy to say that the M’s system has Cliff Lee and Michael Pineda pitching on the same night. Enjoy this. Pineda’s through one inning with two weak grounders and a strikeout of lefty Michael Ryan. He worked at 94-95 with a slow slider at 82. Mostly FBs. All systems go. Peter Bourjos, an Angels prospect, led off tonight. He was also the lead-off man in Cliff Lee’s rehab start. Poor guy must have a really skewed idea of the Rainiers (although he torched the non-demi god portion of the R’s rotation in Salt Lake earlier). And he’s through 2 IP, with two pop-ups, one more weak grounder. Lots and lots of the mid-90s FB. Hoping to see more of his offspeed stuff later. Meanwhile, a Greg Halman broken-bat single plates David Winfree, and it’s 1-0. Another 3 up 3 down IP for Pineda. Broken bat fliner to the SS, a grounder to first and a K.
The Rainiers just tack on another as an Adam Moore double scores Tui from first. This is the strangest team; Moore and Snell look about as hopeless as it gets in the majors but they’re dominant here. Tui’s in the same boat as well, despite reaching base on a swinging bunt. Went to a 3-1 count on Nate Sutton, but then blew him away for the K. Michael Ryan takes the first 3 pitches for a 3-0 count and Pineda steps off to compose himself. Gets to 3-2, then loses him for his first walk, and Adam Moore heads to the mound for a chat. 3-0 on Mark Trumbo now; leaving a lot of pitches up and out of the zone. Aaand that’s two straight BBs. Thankfully, Cory Aldridge swings at the first pitch and pops out to left field. Thanks, Cory! Mike Wilson just launched a home run that might touch down some time after midnight. LF didn’t move. It scored Greg Halman, who’d doubled. Rainiers leading 4-0. Pineda’s tiring a bit; velo’s down, missing spots. 4-pitch walk to lead off the 5th, then gave up his first hit, a bloop fliner to right by Paul McAnulty. He came back to strike out Terry Ryan, got a weak grounder from Colmenares (too weak for a DP), then K’d Peter Bourjos on three pitches. Way to work out of trouble, kid. We are seeing his change more, and I like it a lot more than Bourjos did. 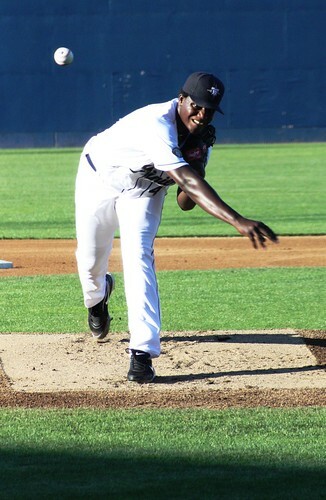 Pineda had a nice quick inning in the 6th, getting a couple of easy GB outs and a deeeeep fly out. Mark Trumbo, the righty who’s leading the PCL in HRs, swung through two straight FBs at 95 and 96, then hit the third (at a mere 94) about 410 feet. But CF in Tacoma accommodates such things, and it ended up a loud out. That’s it for Pineda. 6IP, 1H, 0R, 5K, 3BB. 90 pitches, 60 strikes. Mike Koplove starts the 7th. Way to keep it positive boss. He’s even got a modified Cliff Lee smile thing going. Thank you gentlemen for the updates. Appreciate your time and effort. Couldn’t the M’s use Mike Wilson and his 18 homers on the big club? At some point we need to take some shots on some guys. Wilson’s fun, but he’s still a pretty limited hitter. This is the guy who was eaten alive by the PCL in his 2009 stint. Yes, he’s made some strides, but he’s still a mistake hitter at this point. He’s a semi-polished Halman at the plate, which isn’t nothing, but I’m not sure he’d add a whole lot to the M’s right now. Again though, he’s made a lot of progress, and it helps that he’s healthy. But I’d like to see both Halman and Wilson continue to work on some things down here. And no sooner do I type the above comment does Wilson hit a sharp single on a fairly tough off-speed pitch. Nice job! Unfortunately, Brad Nelson was thrown out at the plate by 10 feet. How was his Slider tonight? And what was his PC at when he left? Didn’t like the walks but I’m sure the adrenaline was wearing out from his first AAA start. I’ve got a comp for Michael Pineda. I’m ex-CITED about this guy. Last year when we traded so many A-ball arms (Lorin, Adcock, Pribanic, Williamson) I was grateful when I saw Pineda was not among them. He’s a big guy, isn’t he? Moore’s not small himself, and he’s looking up. 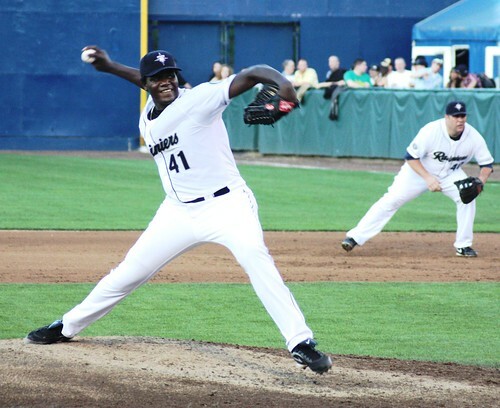 Pineda looks like he has plenty of lower-body power (which is always good — you don’t want someone throwing that hard to be getting it all from his arm). Hey, want to get completely and unrealistically giddy? Compare Marc’s photo with this one. BTW, over at LL Mr Sullivan has some nice observations from Mike Curto and Ryan Divish, who of course were also on-hand (Divish got some quotes from Moore as well). Pineda makes that inverted W with his delivery. That may be the reason for his injury last year. This is the arm action that is blamed for derailing careers. Its something to monitor closely. 1st time post. 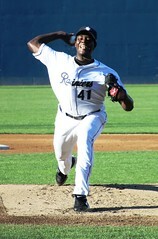 Once I heard Pineda had been called up I rearranged my schedule so I could head out to Cheney and check it out. I live in Gig Harbor so it wasn’t much of a drive. First off there was nowhere near 3,000 people at the game. I would say more like 1,500 at the most. Not sure how Cheney comes up with attendance figures. Pineda was DOMINANT. In his warmup before the game, literally EVERY Rainier just basically hung out a few feet from the mound checking him out. 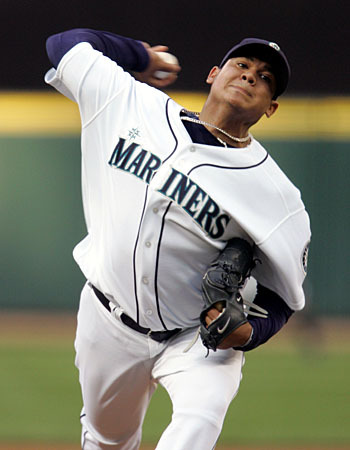 I saw Felix’s 1st start in Tacoma back in 05′ and the whole thing seemed eerily familiar. The first 3 innings were really something. I think he had something like 3 K’s, 5 ground balls, and a weak pop-up. One thing I saw that stood out was the dude’s composure. Even when he walked 2 in the 5th (I think), his demenor and gameplan did not change a bit. Pound the corners with mid 90’s heat, mix it up with a change or slider. The dude knows how to pitch. I was even impressed with his offspeed stuff. Both his slider and change are definitely a work in progress, but I was still encouraged. 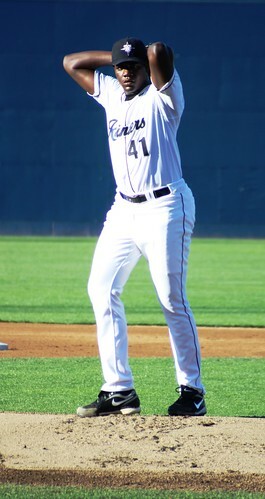 He can get away with subpar offspeed stuff in Tacoma, but not in the bigs. I hope they don’t try to rush him too fast. Unless he mows down the PCL for the next month or two, he definitely could use some time in AAA. Also, on a side note…..Ian Snell is a cool dude. A lot of people would be bitter given the situation, but he was all smiles and interacting with the fans like they were his best friends. Any time a kid came near him, he engaged him in a conversation about baseball or life or whatever. Im only mentioning this because before yesterday, I was thoroughly convinced Snell was a petulant headcase. That’s not the case. I think he just spent too much time in Pittsburgh. The people claiming that the inverted W leads to a disproportionate number of pitching injuries have nothing but anecdotal evidence, as far as I know. There may be something there, or it may be one of the latest in a string of total shots in the dark. Pitching mechanics are something about which a lot of people claim advanced knowledge when in terms of the science of the whole thing they’re in way, way over their heads. It may not be the problem for Pineda, but until he proves his durability, you shouldn’t eliminate potential causes of his past injury, to help protect his future. Pineda makes that inverted W with his delivery. That may be the reason for his injury last year. This is the arm action that is blamed some guy named Chris O’leary claims has derailed careers. Its something to monitor closely. O’leary’s done some nice work on the ‘net on pitching mechanics. I’m informed he’s done it out of his own passionate interest in the subject. He’s also a pretty nice guy from having seen his posts on various web forums. But his opinion’s are not really considered authoritative. “Inverted W” gets panned because it indicates late external rotation in the pitching arm putting extra stress on the anterior shoulder capsule ligament. Maybe, maybe not. I’m with JH on this one. You absolutely should not eliminate “potential” causes for Pineda’s past durability problems when a) that “potential” is based on zero hard evidence and b) tinkering with his mechanics could affect his control or velocity (or both), or cause an entirely new injury by putting new stress on different muscle groups in different proportions. 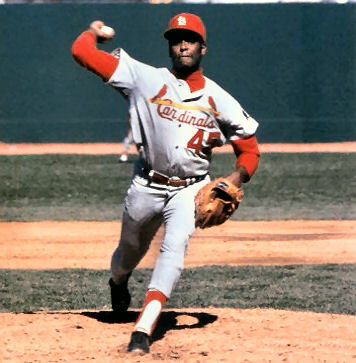 Maybe some day someone will look at all pitchers with inverted W’s, and compare their rate of suffering specific injuries to the general population of pitchers, normalize it for workload, age, body type, and a dozen other noise-making factors I haven’t though of in the past 10 seconds, and determine whether or not he/she can find statistical significance. Until that day, I put about as much faith in those who blame the Inverted W for pitchers’ arm woes as I do in asking Jobu to come and take the fear from the bats. That way we’d have some basis to judge the value of this kind of “analysis” and whether it is any better than a coin flip. As it is right now, I’d be betting on the coin; most of their “successes” seem to be post-facto “explanations” of injuries that already happened.